Q What are you reading now? A. I tend to read a few books simultaneously. At the moment, apart from manuscripts, I’m almost done with Neil Gaiman’s Graveyard Book, midway through a thriller called After the Crash by Michel Bussi, and have just begun a classic that was recently recommended to me – Their Eyes were Watching God by Zora Neale Hurston. Q Which books did you grow up reading? What do you return to and reread? A. The books I go back to are ones that I enjoyed very much as a child, many of them Bengali. Sukumar Ray’s poetry and stories and plays in Bengali never fail to lift my spirits; Abanindranath Thakur’s Raj Kahini and Buro Angla still fascinate me like they did when I first read them, or rather heard them because they were first read to me by my grandparents before I learnt to read; short stories by Saradindu Bandopadhyay, Sibaram Chakraborty, Satyajit Ray, Premendra Mitra. Then there’s Edgar Allan Poe for the chills; Alice in Wonderland, which I can just open at any point and discover something profound in; and Asterix and Calvin and Hobbes comics. The other books I go back to are - To Kill a Mockingbird, and more recent reads, Neil Gaiman’s The Ocean at the End of the Lane and Erin Morgenstern’s Night Circus. Q Tell us about your work as an editor and publisher. A. For a publisher, it’s important to have an editorial instinct – knowing that there’s a readership for something. So you’d have to have the combined factors of editorial taste and knowing the profit and loss math as well. It’s a balance of the two. Q What sort of books do you work on? A. I acquire and publish across genres, which is fun and keeps things interesting. So while I’ve done Krishna Udayasankar’s Aryavarta trilogy (Govinda, Kaurava and Kurukshetra), which is very well done mytho-fiction, I’ve also done literary novels and translations (Manjula Padmanabhan’s The Island of Lost Girls, Samim Ahmed’s Seven Heavens translated by Arunava Sinha, Saikat Majumdar’s The Firebird), political nonfiction like Tavleen Singh’s memoir Durbar, which was exciting because it had emergency history and political gossip from the years after, and Anita Raghavan’s The Billionaire’s Apprentice on the Rajat Gupta scandal. Coming up there is Pradeep Sebastian’s wonderful novel on book collectors and book thieves, and non-fiction narratives on food and culture by Marryam Reshi and Anoothi Vishal that I’m looking forward to working on. A. I like to read fashion magazines and about fashion weeks and trends across the world, and have friends who are fashion designers – but my own dressing and style has more to do with comfort above anything else. I love dupattas, and dressing up simple kurtas with them. They can be in traditional weaves and designs, or hand-painted or in bright prints. I love my denims too – jeans and capris, shirts, shorts – and structured trousers and tops. I like wearing contrasting or unusual colour combinations. 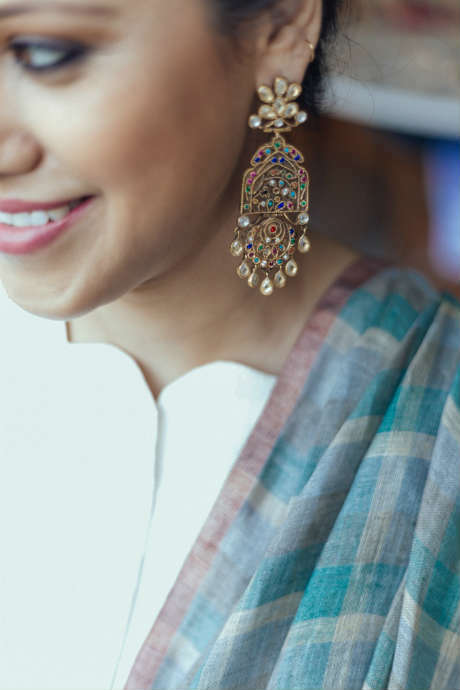 Unfortunately, I don’t wear saris as often as I’d like to, and I’m glad this shoot gave me an opportunity to wear unusual drapes and get dressed up!